Corsair has released their new Bulldog 2.0 Barebones PC kit, offering a Z270 motherboard, an AIO liquid cooler and an 80+ gold rated PSU in a console like form-factor. 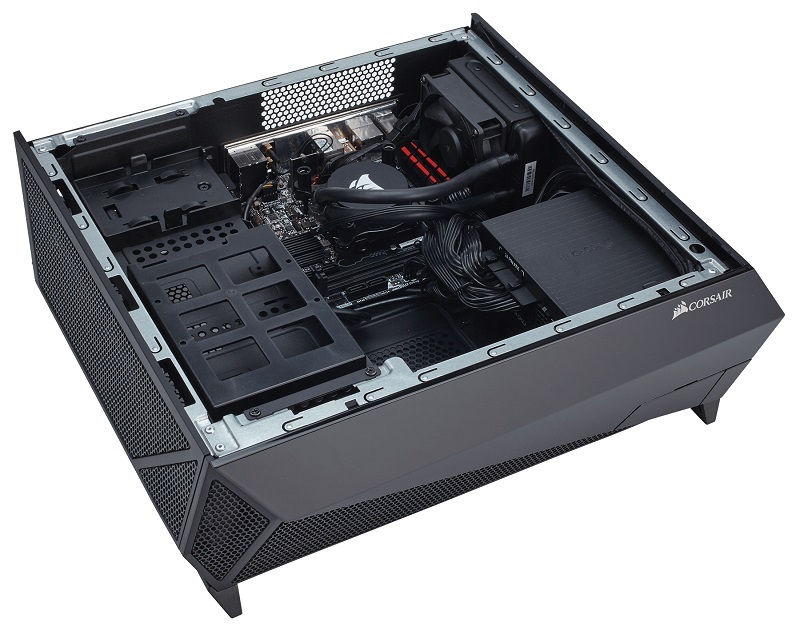 Read more on Corsair's Bulldog 2.0 barebones system. It's a bit gamer but it looks to be pretty good value. The GPU goes in face down? So it draws air in from underneath the case? I guess it's more for blower type and hybrid GPUs. I'm after something to be a plex server and nas so for the price it's not bad compared to a 2 or 4 bay NAS from Qnap or Synology. Of course they have the CPU included but they're typically only a Celeron or i3. I wonder how quiet it is..
Looks like they were trying for this to go in people's home entertainment area.. rule 1.. make the thing symmetrical at least from the front, otherwise it looks daft. I just want someone to make a decently priced / sized / cooled PC case/system that has that 'This is a HiFi / Decoder / Amp' look, and do it well without looking tacky/cheap. Yeah agreed. Look at the Silverstone HTPC cases and they're gorgeous. I think this is more for 'console wars. To go get a gaming pc into the living room as opposed to the XBone/PS4. The design and marketing would have used terms like 'aggressive' 'dynamic' styling... so nothing you'd want your adult friends to see. I don't hate the look but it's not going to match your Harman Kardon AV receiver. That's the only one I could see on the sites with that kind of form/orientation. The Fractal Design Node 605 is better cause it has a door in the front of the case so you don't see the USB and front panel audio.